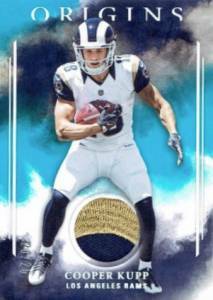 An early-season favorite for many collectors, 2017 Panini Origins Football has quickly assumed the void left by Topps Inception. Every hobby box contains three hits with at least one being of the hard-signed variety. Mainly relying on the debut format from 2016, the single-pack boxes include one rookie autograph, one jumbo rookie patch autograph and one jumbo or patch relic card. 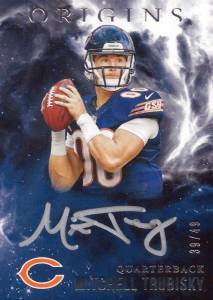 While the base set is there to fill out the rest of the seven-card boxes, the 2017 Panini Origins Football checklist is primarily focused on the autographs and relics. 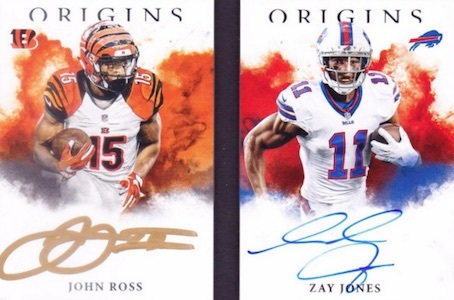 Promising one on-card autograph in every box, 2017 Panini Origins Football is filled with first-year signatures. 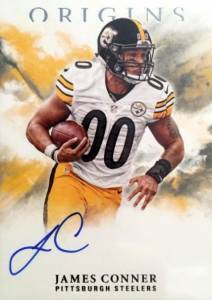 The main Rookie Autographs set tackles 40 of the top names from the 2017 NFL Draft with on-card editions. Skewing to a darker color scheme, Origins Autograph (#/99 or less) inserts showcase silver or gold ink. Passing Stars Signature cards naturally highlight the quarterbacks, switching the orientation to horizontal. 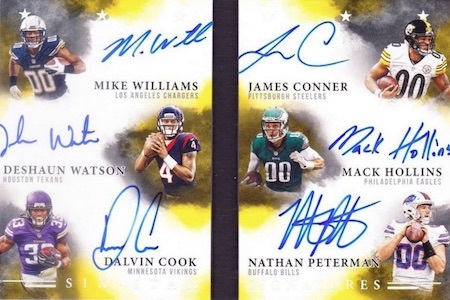 Pairing up many of the biggest stars of the rookie class, the multi-player inserts include Rookie Stars Dual Signature Booklets, Quad Rookie Autographs and Six Star Signatures Booklet. Each is limited to 10 copies or less. Bringing memorabilia pieces into the equation, 2017 Panini Origins Football features at least one autographed relic per box. 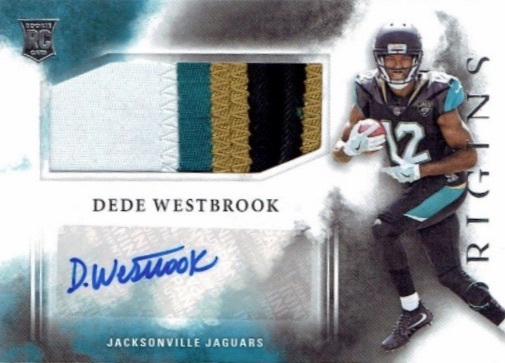 The Rookie Jumbo Patch Autographs insert comes with rare parallels like the Black Nike Swoosh. Very limited, the Rookie Booklet Patch Autograph set incorporates an oversized relic into a two-panel design. The are also premium Laundry Tag, Glove and NFL Shield Black versions. 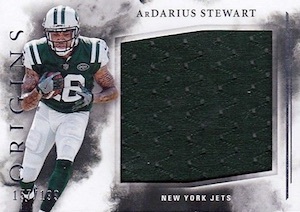 In addition, Rookie Jumbo Jersey cards are among the unsigned hit choices. 1 1 RC AUTO KAREEM HUNT 2017 Origins BGS ENCASED ROOKIE '18 Green Proof LTD EDI. * CURTIS SAMUEL 2017 PANINI ORIGINS RC ROOKIE BOOKLET JERSEY PATCH AUTO # 10 ! 2017 Origins Rookie Patch Autograph Gold Alvin Kamara RC RPA 10 SAINTS LOGO!!! PARALLEL CARDS: Red #/299, Orange #/150, Blue #/60, Turquoise #/25, Gold #/10, Green #/5, Black 1/1, Printing Plates 1/1. PARALLEL CARDS: Red #/99, Blue #/49, Turquoise #/25, Gold #/10, Green #/5, Black Nike Swoosh 1/1. PARALLEL CARDS: Gold Ink #/25, Gold Ink Inscriptions 1/1. PARALLEL CARDS: Red #/99 or #/49, Blue #/49 or #/25, Turquoise #/25 or #/10, Gold #/10 or #/5, Green #/5 or #/3, Black 1/1. 10 cards. Serial numbered #/5. Shop on eBay. 16 cards. Serial numbered #/25. Shop on eBay. PARALLEL CARDS: Gold #/10, Gloves #/2, Black NFL Shield 1/1, Black Nike Tag 1/1. 30 cards. Serial numbered #/199. Shop on eBay. PARALLEL CARDS: Red #/99, Orange #/75, Blue #/49, Turquoise #/25, Gold #/10, Green #/5, Black 1/1, Black Laundry Tag 1/1, Black NFL Shield 1/1, Black Nike Swoosh 1/1. 30 cards. Serial numbered #/175. Shop on eBay. PATCH PARALLEL CARDS: Red #/99, Orange #/75, Blue #/49, Turquoise #/25, Gold #/10, Green #/5, Black 1/1, Black Tag NFL Player’s Logo 1/1, Black Tag NFL Shield 1/1, Black Tag Nike Swoosh 1/1. PARALLEL CARDS: Gold #/5 (Cards #11, 12 - #/3*), Green #/2, Black 1/1. 10 cards. Serial numbered #/25. Shop on eBay. PARALLEL CARDS: Gold #/5 (Card #9 - #/3*), Black 1/1. Now with more autopenned on card autos! Ignore the yo yos. This is one of my favorite products. Two autos (one on card) and really nice looking cards. Can we eliminate reviews that have no bearing on the current product? Dak autopen issues related only to 2016 select football. Not Origins. Regardless, this is one of my favorites every year. On card autos of the new draft class, with a great design. Thick card stock, excellent player combos and a large collector base. agree with Mike, only thing is some of the players beat their corners up. definitely will be better condition than the immaculate college though! Whats the deal with the booklet auto patches? Ive seen 2 for sale on ebay, 1 being an Alvin Kamara where the patch is 0, where there’s not a “o” in his name, or on a saints jersey…the 2nd card was a Mitch Trubisky patch auto, with the patch also being a “0”…..is it because while making the cards, they dont know the numbers, so when it comes to sticking a patch on card, they just stick a “0”….seems like made up patches…thanks for any info trey! Caleb, Most all of the early Panini football products have patches, jerseys, ect. from the NFL rookie premiere. That’s why you are seeing the 0’s for patches on guys that don’t have that number or letter O in their last name. Only Dallas Cowboys in the base set. No Switzer or Taco Autos that I am seeing (unless I missed something). Always a pretty good product but you left out JT Watt and put in Joshua Dobbs…..Blah. 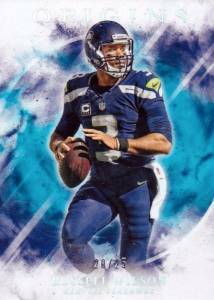 Hands down best premium football cards for the money with most bang for your buck. On card autos are beautiful and card design is clean.